To say this book was amazing and carried an amazing message is not doing it the justice it deserves. This book was so not what I expected. To say it bluntly I thought this was going to be a book I was going to hate. 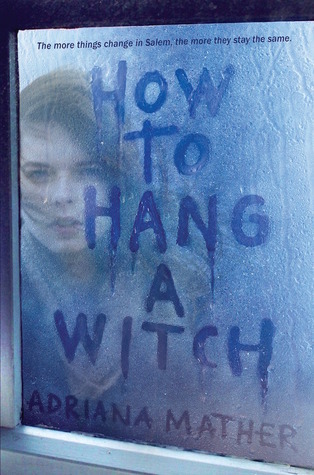 I've been pagan for over 20 years and to read a book that's titled on How to Hang a Witch I didn't think it was going to work out so well. Well, can tell you how wrong I was. This book is more than just your normal mystery or a book where a girl comes into her own and finds her way. It's even more than just simple good vs. evil. Becuase who are we to say who is good and who is evil. This book said a great thing at the end. Which I am going to share with you. "You see, "witch" is merely a title. It is not the title that is inherently bad but the people who decide what that title means." "If a man fears dogs, he may beat one with a stick when he sees it. As is the nature of all creatures, that dog will bite him. And then he may tell everyone that he was right about dogs, that they are evil. But I ask you, who is at fault in this scenario, the man or the dog?" "Now picture the story again but with two men." This gives you a great picture of how things like the Salem Witch Trials began. One person says something is evil and it balloons out from there. Last year I was the subject of such a discussion. I lost people that I had been friends with for years. And even when I told the truth no one would listen. So I feel for the main character Sam. Becuase even though you may be screaming at the top of your lungs and you could have all the proof in the world you cant force people to believe you. So before you join the linch-mod maybe you should step back and listen to all sides. This book was eye-opening even to me. It started out with some great mystery and yes I did figure out who the big bad was before the reveal but I still loved it!! Right before the big reveal I started thinking it was someone else but that ended up being wrong and I was right the first time around. I really enjoyed how the mystery unfolded slowly but still at a good pace. And I'm excited to see that this is a series. I can't wait to see what the next book will be about. The characters were so alive for me and I loved every one of them. I really liked how the Descendants were all creepy mysterious. And that the town depicted so beautifully. I would have to say that my favorite character was Elijah and Sam. My favorite place would have to be the gardens. I really hope to one-day visit Salem one day. I've been to Boston twice but have never had the pleasure of getting there. This book will grip your heart and not let you go until the very last page. Where I shed a few tears. I won't lie!! I hope we get to see more of a certain someone in book two since it seems like they are still there. But if not I'll fully understand that their part of the story is complete and over. I am really happy that I was fortunate enough to read this story it will stay with me for years to come. I think this one would work great in schools to deal with the topic of bullies, harassment, and more. That it does really show you how things can get out of hand quickly and that hate just isn't the way to stop it. Learning to accept those who are different as well as hearing all sides out is a lot better than listening to the lies and distrust and hate that people tend to listen to more. "Witches can be both good and evil. They are the persecuted and the powerful. They provide women with a broad range of ways of being that subvert the typical stereotypes. When looking at world religions, many goddesses appear in relationship to gods. They are the consort, wife, or mother. And they are partially defined by their counterparts. But the witch is defined by no one. She is her own person." “My problem is, I don’t know when I’ll see my dad,” I say, staring out at the well-­worn New England homes, with their widow’s walks and dark shutters. Three months, twenty-­one days, and ten hours. That’s how long it’s already been. We pass a row of witch-­themed shops with dried herbs and brooms filling their windows. For the first time during this roller coaster of a car ride, my stomach drops in a good way. Number 1131 Blackbird Lane, the house my dad grew up in, the house he met my mother in. It’s a massive two-­story white building with black shutters and columned doorways. The many peaks of the roof are covered with dark wooden shingles, weathered from the salty air. A wrought-­iron fence with pointed spires surrounds the perfectly manicured lawn. The redbrick driveway is uneven with age and pushed up by tree roots. Vivian’s silver sports car jostles as we make our way through the black arched gate and roll to a stop. “Ten people could live here and never see each other,” I reply. I pull my hair into a messy ball on top of my head and grab the heavy duffel bag at my feet. Vivian’s already out of the car, and her heels click against the brick. She makes her way toward a side door with an elaborate overhang. I take a deep breath and open my car door. Before I get a good look at our new home, a neighbor comes out of her blue-­on-­blue house and waves enthusiastically. “Helllloooo! Well, hello there!” she says with a smile bigger than I’ve ever seen on a stranger as she crosses a patch of lawn to get to our driveway. She has rosy cheeks and a frilly white apron. She could have stepped out of a housekeeping magazine from the 1950s. “Nonsense. That’s a boy’s name. Now, aren’t you pretty. Too skinny, though.” She steps back to get a proper look. “We’ll fix that in no time.” She laughs a full, tinkling laugh. I smile, even though I’m not sure she’s complimenting me. There’s something infectious about her happiness. She examines me, and I cross my arms self-­consciously. My duffel bag falls off my shoulder, jerking me forward. I trip. As he gets closer, his sandy hair flops into his eyes. Blue. One corner of his mouth tilts in a half smile. I stare at him. Am I blushing? Ugh, so embarrassing. He reaches for the bag, now awkwardly hanging from my elbow. “This is my son, Jaxon. Isn’t he adorable?” She pats him on the cheek. “Certainly. And I knew your grandmother. Took care of her and the house when she got older. I know this place inside and out.” She puts her hands on her hips. “No, that’s alright. We can show ourselves around.” There’s a finality in Vivian’s response. Vivian doesn’t trust overly friendly people. We had a doorman once who used to bring me treats, and she got him fired. Vivian turns around without a goodbye. Jaxon and I follow her to the door. “Even when your grandmother was alive?” He closes the door behind us with a click. “I never met my grandmother.” It’s weird to admit that. In the front foyer are piles of boxes—­all of our personal belongings from the City. Vivian sold everything heavy when she found out this place was furnished. We step past the boxes into an open space with glossy wooden floors, a wrought-iron chandelier, and a giant staircase. Vivian’s heels click somewhere down the hallway to the left—­a sound that follows her around like a shadow. As a child, I could always find her by listening for it, even in a roomful of women in high heels. I wouldn’t be surprised if she slept in those shoes. I take in our home for the first time. Paintings in gold frames hang on the walls, separated by sconces with bulbs shaped like candles. Everything’s antique and made of dark wood, the opposite of our modern apartment in NYC. This is some fairy-­tale storybook business, I think, looking at the curved staircase with its smooth wooden banisters and Oriental rug running up the middle. “This way.” Jaxon nods toward the staircase. He lifts my bag off my shoulder and starts up the stairs. “I know. But I wouldn’t want you to fall again. Stairs do more damage than driveways.” So he definitely saw me trip. He smiles at my expression. This guy is too confident for his own good. I follow him, holding the banister in case my clumsiness makes a second appearance. Jaxon turns left at the top of the stairs. We pass a bedroom with a burgundy comforter and a canopy that any little girl would go bonkers over. After the bedroom, there’s a bathroom with a giant claw-­foot tub and a mirror with a gold-­plated frame. He stops at the end of the hall in front of a small door that looks like it could use a fresh coat of paint. The doorknob’s shaped like a flower with shiny brass petals. A daisy, maybe? I twist it, and the wood groans as the door swings open.